44 Commercial Real Estate and Properties in Cairns are listed in 8 categories. We have 103 Retail Shops for Sale & Lease , 64 Offices for Sale & Lease , 42 Industrial Warehouses for Sale & Lease , 21 Development Lands for Sale & Lease , 5 Commercial Farms for Sale & Lease and 4 Hotels and Leisure for Sale & Lease . 3/49 Supply Road, Bentley Park Contact agent Grant Timmi..
130 sqm approximately warehouse/office for lease 65 sqm approximately warehouse double automatic roller door with 3 phase power and sink 65 sqm approximately office kitchen and amenities Contact: Exclusive agent Grant Timmins Ray White Commercial Cairns for more information. 1,044 Sqm Industrial Warehouse For Lease - Bruce Highway Visibility Contact agent Scott Green..
We offer this solid industrial warehouse for lease at 41 Hargreaves Street, Bentley Park. Building area approximately 1,044 sqm and available as one lot or half. It is divided into two tenancies and configured into predominately warehouse with showroom/offices of approximately 80 sqm at the front of each tenancy. The warehouses are clear span with an internal clearance of approximately five to six metres. Roller door access, two along the side and one at the rear of the northern tenancy with two side roller doors in the southern tenancy. 3 phase is connected and there is chain wire fencing for additional security. In a planned industrial estate with underground power, kerb and channeling and wide streets. All essential services including dining options, supermarket, postal, doctor, pharmacy, gymnasium and many others. On and off street parking for staff and customers and just nine kilometres south of Cairns CBD. This industrial building has been well maintained by the lessors. Contact: Agent Scott Green Ray White Commercial Cairns for more information. Bungalow Industrial Warehouse For Sale Contact agent Scott Green.. Inner city industrial warehouse for sale in Doyle Street, Portsmith only 3 kilometres from the city centre. Warehouse dimensions are 17 metres deep x 13.5 metres wide with 5.4 metre internal clearance. Small 28 sqm front administration office with rear toilet and shower. Warehouse has three roller doors, 3 phase power and internal lighting, chain wire security fencing and concrete car park at the front of the building. Close to all services and facilities. Contact: Agent Scott Green Ray White Commercial Cairns for more information. 120 Sqm Storage Shed For Lease Contact agents Helen and ..
120 sqm warehouse 12 sqm office Perfect for mechanic looking for extra space. Contact: Exclusive agents Helen Crossley and Grant Timmins Ray White Commercial Cairns for more information. Woree Business Park Warehouse 240 Sqm For Sale Contact agent Grant Timmi.. Lot 9 is available for sale in the Atticus Trade Centre in Woree Business Park. 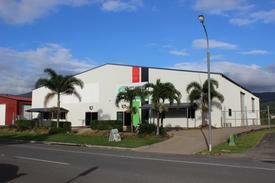 A quality industrial warehouse in close proximity to the Bruce Highway. Good pylon signage visibility. Concrete, tilt panel construction, fully insulated roofing and kitchenette and disabled toilet. Powered 6 metre roller door front of warehouse. Three car parks included. Contact: Agent Grant Timmins Ray White Commercial Cairns for more information. Versatile Factory / Warehouses / Modern Offices In Major Cairns City Industrial Location $13,750 + gst pcm + outgo.. Looking for a close to home office space? Check out this immaculate first floor office in a small warehouse complex for lease at just $220 per week. Modern fit out with a full kitchen, bathroom and laundry. 2 x offices at 11 sqm approximately. 25 sqm open plan office/waiting room. Security cameras on site. 1 exclusive car park on site. Plenty of street parking. Good building signage available. Contact: Exclusive agent Grant Timmins Ray White Commercial Cairns for more information. Mundoo Airport - Aviation Logistics Hub Site For Sale Contact agent Helen Cross.. Offered for Sale, this freehold property is in the area known as Mundoo being approximately five kilometres south of the town of Innisfail. The site is at the end of Cardier Road and adjoins the Mundoo Airfield servicing Innisfail and nearby areas. The surrounding area is comprised mainly of sugar cane and banana farms with a small number of rural and rural/residential properties. The current property use benefits from the close proximity to the airfield as direct access is available. Other aircraft facilities, including hangers are located on the opposite side of the airfield. The total land area is 1.313 hectares with a building area of 1,155 sqm. The building area is made up of a large industrial building that includes an office, toilet/bathroom area, former residence, storage area, aircraft hanger, chemical preparation and storage area and a small patio. The building was constructed around 1985 and additions made around 1999. The site is currently leased on a month to month basis for aircraft storage. Mundoo is located adjacent to the major highways connecting Far North Queensland with Cape York and south to central Queensland, along with the north/south rail link and a short 20 minute freight transfer to Mourilyan harbour. Destined to be the logistics hub for Northern Australia as it is perfectly placed and central within a thriving and diversified farming region. Contact: Exclusive agent Helen Crossley Ray White Commercial Cairns for more information. Portsmith Trade Centre - For Lease Contact agents Helen and .. Lot 1/49 Cook Street, Portsmith is for lease. 377 sqm of net lettable area. Ground floor level 108 sqm approximately consists of reception/waiting room, office administration area, three offices, kitchen and two toilets with one being unisex disabled. First floor level of 109 sqm approximately consists of four offices and one large boardroom. The warehouse is an open area of 144 sqm approximately, clear height of 6 metres and wide, electric roller door access to the rear. There is a privately accessed outdoor courtyard of 16 sqm approximately. Five allocated car parks are included. Three exits from building, front door to Fearnley Street, rear door and roller door access from the car park. Great exposure to marine with the Fearnley Street boat ramp only 50 meters away. Contact: Agents Helen Crossley and Grant Timmins Ray White Commercial Cairns for more information. Here is a unique opportunity to own a thriving family run quarry business on the Atherton Tablelands Far North Queensland. Operating very successfully for 28 years, we are fully licensed to extract, crush and screen granite with known reserves in excess of 20 million tonnes. This is an amazingly easy to operate business which needs new blood to realise the huge potential. We have a quality reputation that a new owner can leverage to realise that potential. Cattle Camp Creek Quarry is perfectly located on the Atherton Tablelands, just a few kilometres away from the commercial hub of Atherton. The property is easily accessible from the Kennedy Highway and is close to the constantly grown city of Cairns which is the unappointed capital of Far North Queensland. Our site is well recognised for supplying a range of high quality gravels and road base products to a variety of regular repeat customers including local councils, developers and builders. Our high reserve site produces a broad range of rock including gravel, sand, topping sand, crushed rock, shot rock, large landscaping rocks, small/oversize/trench rock, decorative stones, crusher dust, and deco fill. We comply with all relevant environmental laws and have all the required permits and insurances in place. The land has a crown lease that secures the quarry operation and provides an exclusive Sales Permit for its products. The asking price includes the business operations, plant, equipment, and material stockpile. The site promises huge expansion in revenue streams under the guidance of a seasoned entrepreneur who can upgrade the plant to supply 2.1 standard gravel materials for Council works. With 20 million tonnes of reserve, the site is a lucrative investment for a secure profitable future. Features of the quarry business: Family run quarry business operating for 28 years in Atherton Tablelands High reserve value land with 20 million tonnes of reserves Massive annual net profit of $200,000 with huge expansion potential All licenses, insurance and permits in place Crown lease on land that secures operations and provides sales permit of products Asking price includes operations, plant, equipment and material stockpile Easy to run business with walk in and walk out sale Full training from seller both prior and post settlement With the best resource product, location, and high growth potential, this is a cash flowcopportunity from day one that should not be missed. The well recognised business needs a talented operator to take it to the next level of development to become the chief source for road base and quarry material in the region. If the idea of entering this flourishing sector has got you all charged up, then give us a call TODAY! Easy Access Onto Arterial Road Warehouse - For Lease Contact agents Grant and ..
5/21 Donaldson Street, Manunda. Close to main arterial road Anderson Street and Captain Cook Highway, making it easy to access warehouse for loading/unloading. Minutes to Cairns CBD and Cairns Airport. 219 sqm of open space perfect for storage or warehousing. 3 air conditioners in warehouse. Contact: Agents Helen Crossley and Grant Timmins Ray White Commercial Cairns for more information. Office/warehouse For Lease - Close To Cbd, Ports, Southern Access Road Contact agent Scott Green..
Land area 2,006 sqm Warehouse 861 sqm Offices 71 sqm Security gate on side driveway with easy access from a very wide street Modern office/showroom with split system ducted air conditioning and some office furniture including 8 desks Air conditioned staff/lunch room with built in dishwasher. Alternatively the space can serve as an additional private office Separate male and female toilets NBN optical fibre connection to building Dedicated communications cubicle with equipment rack and patch bays and distributed data cabling throughout the building Sophisticated "Tecom Systems Challenger" security alarm system with motion sensors and magnetic switches to doors Large, clear span warehouse Excellent natural lighting via roof skylight panels High bay lighting 3 phase power with upgraded electrical switchboard 2 x 800 mm diameter industrial quality roof mounted ventilators Easy access via 4 large roller doors 3 motorised Large pylon sign with ample opportunity for signage on building fascia Concrete hard stand area with approximately 10 front and rear car parks on site External signage lights and security floodlights Low maintenance garden beds and grounds Contact: Agent Scott Green Ray White Commercial Cairns for more information. 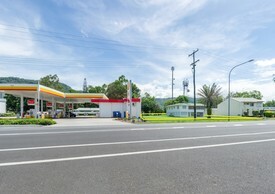 Cairns Development Site - Price Reduced Contact agent Helen Cross.. The owner of this excellent development site very close to Cairns CBD at 102 Hartley Street has reduced the price for an immediate sale. The rectangular site of 4,535 sqm currently has an excellent holding income from a set of fully leased warehouse/workshops that would not obstruct the development process. Zoning is medium impact industry. Contact: Exclusive agent Helen Crossley Ray White Commercial Cairns for more information. Port Douglas’ Prime Highway Frontage Expressions Of Interest S..
Mini Storage Warehouses Available - Portsmith Contact agent Helen Cross..
Are you moving house, running out of room in the office, relocating, need to store the boat or just have some excess you need to find a safe home for? We have mini warehouses available for lease right now! At 3m x 6m these little gems are your perfect storage solution Centrally located Close to CBD Affordable Contact: Exclusive agent Helen Crossley Ray White Commercial Cairns for more information. Brand New Sheds Ready To Rent. $300 + GST per week incl ..
225 Sqm Warehouse Close To Cbd Contact agent Scott Green.. Inner city industrial warehouse for lease in Doyle Street, Portsmith only 3 kilometres from the city centre. Warehouse dimensions are 17 metres deep x 13.5 metres wide with 5.4 metre internal clearance. Small 28 sqm front administration office with rear toilet and shower. Warehouse has three roller doors, 3 phase power and internal lighting, chain wire security fencing and concrete car park at the front of the building. Close to all services and facilities. Contact: Agent Scott Green Ray White Commercial Cairns for more information. Shed / Warehouse / Factory & Vacant Land - Owner Wants It Sold! Massive price reduction! .. SHED / WAREHOUSE / FACTORY / VACANT LAND Two allotments are being offered in Mossman's industrial estate, back to back with separate street access to both allowing complete drive through from one street to the other (from Quaid Street to Allan Close). 8 Quaid Street features an extremely high clearance shed (596 m² floor area) plus office and amenities (a further 91m²) with a semi enclosed machine room which has a mezzanine storage area above (a further 36m²). The open plan shed is solidly constructed with concrete floors, driveway and parking area. There is 3 phase power, air compressor and hose fittings throughout. The office & amenities component features Masonry block interior and exterior walls also with concrete slab & tiled floors, split system air conditioning & ceiling fans. The lunch room is spacious with sink and floor & wall cupboards. The bathroom even boasts a shower recess. Set on an 1170² with chain wire fencing and extensive concrete hard stand / parking areas this building is ready to move your business into or rent out as an investment. The second allotment, 5 Allan Close, is a further 1123 m² and ready to use in conjunction with the existing shed or develop at your convenience. Solid, Industrial Warehouse For Sale Contact agent Scott Green..
We offer this solid industrial warehouse for sale at 41 Hargreaves Street, Bentley Park. Building area approximately 1,044 sqm divided into two tenancies and configured into predominately warehouse with showroom/offices of approximately 80 sqm located at the front of each tenancy. The warehouses are clear span with an internal clearance of approximately five to six metres. Roller door access, two along the side and one at the rear of the northern tenancy with two side roller doors in the southern tenancy. All are powered. 3 phase power is connected and there is chain wire fencing for additional security. In a planned industrial estate with underground power, kerb and channelling and wide streets. All essential services are available close by including dining options, supermarket, postal, doctor, pharmacy, gymnasium and many others. On and off street site parking for staff and just nine kilometres south of Cairns CBD. The property is currently vacant but prior to this has always experienced high occupancy since construction in 2008. This is a unique industrial building that has been well maintained by its owners. Contact: Agent Scott Green Ray White Commercial Cairns for more information. Industrial Warehouse For Lease 522 Sqm Contact agent Scott Green..
Highway visibility and just 10 minutes to the CBD 522 sqm warehouse available for lease. Clear span warehouse with double roller door access, 3 phase power, electric roller doors. Negotiable pricing. Contact: Agent Scott Green Ray White Commercial Cairns for more information. Showroom / Retail / Warehouse Close To Water Contact agents Grant and ..
Large retail / workshop available in a new building next to the Portsmith boat ramp. Perfect for a retail marine use business. Excellent exposure and signage rights. The area consists of: Ground floor offices / reception / bathrooms/ tea room / outdoor courtyard totaling 108 sqm Warehouse of 144 sqm First floor offices / boardroom totaling 109 sqm Smart building on corner position close to Cairns CBD Contact: Agents Grant Timmins and Helen Crossley Ray White Commercial Cairns for more information.